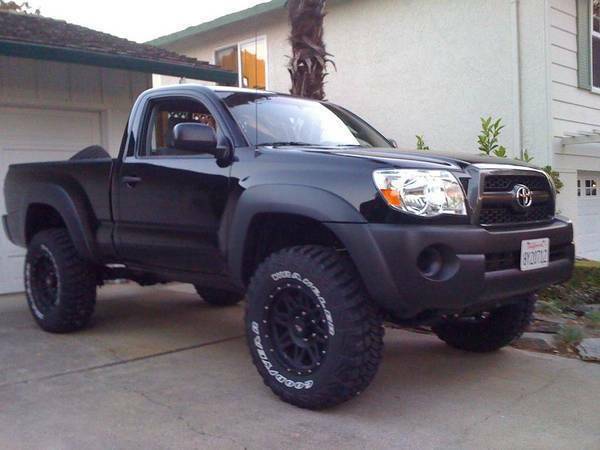 Quick Links: TRD 16" wheels and a lift Part number ,coolant bypass pipe,2006 2.7L? Opinions on my OCI? Pre-runner sounds like it's running on two cylinders on start up 4 Banger Exhaust Sound Clips! Dynomax super turbo muffler? Fat tires on a 4 banger without regearing works! Discussion in '4 Cylinder' started by chad68, Oct 8, 2010. Yesterday I had Kumho Road Venture MT's 305/70/16 (33") installed. They replaced the same Kumho's that were on there that were 265/75/16's (32"). I'm glad to say I could not notice any differance in how the truck accelerates compaired to the 32's that were on there. 3" lift, no body mount or plastic rub (after plastic trimimg) with no regear needed. I think he is a step ahead of you thought. doesnt his truck since its 4x4 have different rear end gearing than yours? Feels just a touch more sluggish, but no complaints. Dumped exhaust, 35 % factory tint, kobalt slim line toolbox, afe pro dry, toyota all weather mats, fog lights soon. How are the Road Venture MTs? I've been after a good personal review of them but they're hard to find. Holy crap bjmoose. That's sick! I love regular cabs and this is one of the best 4WD's I've seen yet. Great job bro. I want to trade my JK for one just like this now I think the OWL looks great BTW. ooooooooo! i like that lol it looks great what lift are you running? He's rocking an OME lift with Dakars in the back and 885's I believe in the front. Yep, that's it. Thx for the compliments. I will put up pics next Sunday. I'm holding off on taking pics till I install my ICON's and maybe a tonneau cover. I did a 200 mile round trip today and didn't see a change in mileage, though I'm sure it's probablly a hair less. You have to remember I already had 32's on it. It seemed to have the same acceleration as with the 32's.